Economic growth in Indonesia is currently showing a progress. As reported by the Kompas media, PT Danareksa (a state-owned enterprise) stated that Indonesia’s economic growth at the end of this year was in the range of 5.2 to 5.3 percent. This growth rate is better than last year which was in the range of 5.07 percent. 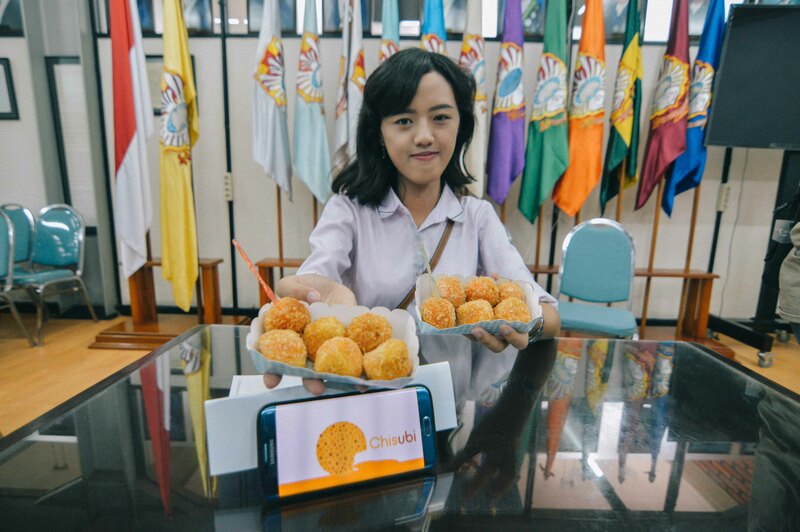 Seeing the good growth, a freshly-graduate, Astrid Olyvia Jasman from the International Business Management (IBM) Program of the Faculty of Business, who won the Best Academic Graduate during the 2017/2018 Even Semester Graduation period, has the desire to open her own business. The desire to set this business up began when she took a course in Entrepreneurship. “During the 6th semester, I took the Entrepreneurship and Feasibility Study course. Ms. Wiwiek Wulan as the lecturer asked us to do a group project. The goal was to do our final semester assignment by making a product in the form of a good or a service that has never existed before,” said the young woman who is more familiarly known as Olyvia. The choice then fell on a type of food that combines local and international elements, named Chisubi. As the name implies, Chisubi is a combination of cheese and sweet potatoes. The product she made was a sweet potato ball with a filling of mozzarella cheese. Olyvia made Chisubi with three of her friends, Anastasia Novitha, Feby Sandra, and Lidia Mery. “At that time, a group of friends and I chose sweet potatoes because sweet potatoes were one of the substitutes for rice that were more practical to eat. Then we combine it with the trend of young people now who like mozzarella cheese,” explained Olyvia who has a hobby of traveling. Together with other innovative products, Chisubi is marketed at Tunjungan Plaza Mall for two days on April 20-21, 2017. As the result, Chisubi received a lot of enthusiasm from visitors. Furthermore, this sweet potato ball is a conduit for Olyvia and her friends to get a perfect grade in their class assignment. “Chisubi received enthusiasm from visitors. If I’m not mistaken, our group was the only one who got an A. We originally thought Chisubi was just a requirement to finish the course. It turns out that it can be an opportunity too. Until now, I still received many inquiries about Chisubi,” said the first child of three siblings. Given her success in running Chisubi, Olyvia also wants to become a young entrepreneur. “At this point, I am still hesitant about continuing Chisubi or creating a new business with my own cosmetic line. I also happen to like make up. For now, maybe I will continue with Chisubi first,” she said with a smile. In addition to reaching her dream of becoming a young entrepreneur, Olyvia also wants to continue to further her education. She wants to challenge herself with hard work while going back to school to continue her study at the same time, the kind of hard work that she did when she was still running an internship. “I want to challenge myself again. I want to get enough experience in a multinational company so that the English level that I have been working hard to improve will not go to waste. At the same time, I also want to take a Master degree program on Saturdays and Sundays. That’s my other dream for now,” she said straightforwardly.